Another busy day here- the rough draft of Way of the Shield has almost reached the point of going over the top of the hill, so it's now a matter of getting all the pieces in place before the drop*. So I'll share another bit of worldbuilding: Druthal's southern neighbor, Acseria. “There must be a God, for no man could make that happen.” –Clwythnn Strongtree, after seeing Acserian zealots storm the bridge at Fencal. “They are a decent people, but I cannot fathom a man who would rather eat a horse than a chicken.” –Olona ab Calisien, Ninth Chair of the Fuergan SyndicateAcseria is a nation centered on their religion and their church. The church rules the nation. The rest of the Trade Nations have felt the church’s influence, as the faith has spread, to a varying degree, throughout them. The church as some very strict tenets and scripture, but the rigidity with which they are followed can vary. Acseria is a theocracy, ruled by the Acserian church. The titles in the church stem from the old Futralian titles, and the hierarchy of the church is as follows. Rei- The highest authority of Acseria-- the Rei has the ear of God, and God has his. When he makes an official proclamation it is law (although it must pass through the Kannan Assembly to confirm that the Rei has not wavered from his faith), and all of Acseria will move at his word. He also votes with the Kannan Assembly, with his vote counting as twenty. DaiKanna-There are eighteen DaiKanna, two for each province of Acseria. They comprise the upper echelon of the Kannan Assembly. Only a DaiKanna can call for a vote. Some matters, such as the elevation of someone to the rank of Kanna, can be voted on only by DaiKanna. Kanna- The main body of the Kannan Assembly, with their being 162 Kanna (18 for every province). The Kanna, like the DaiKanna, are only representatives of their province. While they may bear affiliation for a certain sect or order of the church, they do not specifically represent them. Manall- This is the rank of the leaders of most sects and orders, as well as the central figure religious figure of cities and communities. Shannar- The Shannar is the lowest rank of fully ordained priest, and is the one that the common man has close contact to. Chosen- The Chosen are ministers who lead services and give spiritual comfort and leadership to the people, but the are not ordained, and cannot perform some ceremonies. 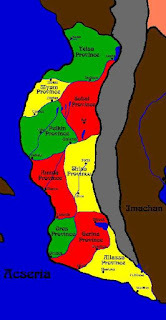 In addition to the church leadership, each of the nine provinces (Telsa, Myam, Sobal, Pelkin, Amida, Shisa, Ores, Gerina and Allassa) has a Prince who has ruling authority, as long as that prince stays in good standing with the church. This is a hereditary title, unless the church sees fit to remove one line of Princes and replace it with another. The Prince is at the top of the feudal system, with nobles below him, who are simply called Lords. Princes live a challenging life, since each one has twenty Kanna and DaiKanna who each feel they have authority over him, and each one will have their own agenda. Law in Acseria is specifically church law, edicts handed down from the Kannan Assembly, all (presumably) based on interpretation of the and other sacred documents. Over the centuries, laws change due interpretation of the scripture and the prevailing attitudes of those in charge. One should not touch one’s brother or sister, parent or child, in the manner one touches one’s wife. One should not eat that which is not blessed and properly prepared. One should not take that which they do not own. One should not separate soul from body. One should respect their betters. One should not speak that which is untrue. One should not touch another man’s wife in the manner they touch their own, nor any who is not their wife. One should not drink that which is impure or intoxicating. One should not take more food than is needed when another is hungry. One should not desire that which is not theirs, nor that cannot be had. One should not take credit for work of God or another man. One should not make one’s rest force another to work, nor rest to leave the work to fallow. Magic fluctuates in acceptance in Acseria. Currently, the official standpoint is that magic is useful and acceptable to God, but it had often in the past been considered heresy and sacrilege. Many Acserians still hold this opinion, and react badly to displays of magic. When accused of a crime, be it against man or God, one is brought before a church leader (usually one of the Chosen, sometimes someone higher) for trial. If guilt is determined, then the criminal is given an Act of Penance, which can range from a series of prayers, to self-flagellation to taking on some form of vow or missionary work. The criminal has the right to volunteer an act for the priest to approve, or else the priest will assign one. Failure to do the Penance Act is High Sacrilege. Any form of High Sacrilege (which requires a Manall to determine) can be punished by Excommunication. Someone who is excommunicated is not part of the community and has no rights. If they aren’t executed shortly after the excommunication (which used to be the fashion, but is currently frowned upon), then they will typically flee to Druthal or another nation. The Acserian military is not strongly organized, but when they lack in structure they make up for in devotion. They are essentially a militia of faithfuls with informal training in how to use their weapons. However, they have been known to fight with fearless abandon. These ordinary soldiers are usually referred to as zealots. These militias are under the authority of the Princes, who use their Lords and vassals to bring it together. The Princes only can call them together with a call to arms from the Rei or the Kannan Assembly. The centerpiece of the Acserian life is their religion. It is a monotheistic relgion, in which their God (referred to simply as God), has a plan for the faithful to follow. In order to help follow the plan, they must act according to his wishes (such as live by the Code of Life), for which they will be rewarded by their souls joining God in the next life. God lets his plan be known to them through signs and omens, as well as use of his divine servants and nine Prophets who are to help guide them. As of 1215, six of the Prophets have come, and three more are expected. The most important Prophet is the second, Acser. In Acser’s time, Acseria was a number of protecterate provinces of the Kieran Empire, and the people living there were somewhat lost in terms of spiritual and cultural identity. Acser started preaching to them about the God and spreading his word, recreating their hope and identity. Acser also brought an end to a conflict with the Imachs that the Kierans were ignoring, and then confronted the Kierans about their hypocrisy. The Kieran legions publicly killed him for this. They then tried to stop his followers and his message, but it instead thrived and spread. Acserians believe that mankind, at least the faithful, have a soul which is separate from the body. The soul is the important, eternal part of the person, and the body is merely a flawed physical expression of the soul. Life on this world is about the triumph of the soul over the body—living in a good and correct manner despite the flaws of the body bringing incorrect urges. They also consider birds, especially hawks, to be sacred creatures—messengers of God and carriers of souls. Most Acserians will wear a talisman of a hawk to show their faith. While the church itself has several orders and sects, the primary division is between the Reformists and the Fundamentalists. They each control a large amount of Kannan Assembly, and essential represent liberal and conservative views of Acserian politics and theology. The following is in no way a complete list of all the factions, orders and sects of the Acserian church. Rather, these are the major factions, the ones that have the most influence in the Acserian church. There are dozens of lesser orders and sects throughout Acseria. FUNDAMENTALISTS- The Fundamentalists believe in returning to the core values of the Acserian faith as outlined by the old Futralian. Morality, to the Fundamentalists, is not a matter of debate, but rather has already been strictly defined by Meliphol and Acser, and therefore by God. The Code of Life centers around how one must live their life. Service to God (and the Acserian community, by extension) must be the primary goal of one’s life. There are further sub-factions of the Fundamentalists, broken down into which book of the Acseriad in the Acseram is most important—the larger sub-factions prefer Ansom, Chedrik and Zanik. REFORMISTS- They believe in following the spirit of faith over the letter of it. The texts of old Futralian (and to an extent, the writings of Meliphol) should be looked at as parable and example, not utter truth. They interpret the Code of Life as being a guideline to what one should do. Sin and transgression are forgivable, and one should be tolerant of new ideas and debate. Sub-factions based on which book is more important exist, but they are more casual, usually just used as points of debate rather than true disagreement. They tend to favor Nalesta, Clienthis and Hiedrovik. PURISTS- Similar to the Fundamentalists, but even more orthodox. They trying and live life as exactly as possible as how the Futralians would. Devoting their lives to service to God, believing that any tolerance of sin is equivalent to the act of sin itself. They also believe that all elements of the texts of the Acseram, even the apocrypha, are sacred and holy, and should be adhered to. LUMINARIES- This order focuses on learning and saving knowledge. Monks of the order are the primary instructors and teaching missionaries. It is the Luminaries who copy, save and archive sacred texts and other writings. THE CIRCLE- This group centers around the idea of God as a more abstract concept, shying away from strict adherence to text and dogma. They tend to be extremely tolerant of sin, transgression and other religions, as they believe that God, in his infiniteness, intends for such things to exist. THE ORDER OF THE HAWK- This is a semi-militaristic order of proselytizers. Members tend to work in or with the armies of Acseria, as officers, chaplain or elite soldiers. They will also do much missionary work in dangerous territories. They do study some fighting and mystical skills, but they focus more on preaching and spreading the good word of the Acseram, with views that lean to the Fundamentalist side. OVALSHANS- This is a smaller sect who have dedicated themselves to the study and care of the Citadel, the architectural masterwork of the prophet Ovalsha. They will be the first to proclaim any event at the Citadel as a miraculous message of Ovalsha, and feel that he is second only to Acser in importance. THE BROTHERHOOD OF THE FEATHER- This order focuses on the Acser presented within the book of Nalesta—Acser as pacifist. The Brotherhood is opposed to the use of violence, and will always work to achieve peaceful solutions. Study of mystical arts is well known to the Brotherhood. EASTERN ACSERIANS- This group is more often referred to as a “cult” by the larger factions, but it has a strong block of followers in the province of Allassa. Eastern Acserianism blends Acserian belief with Imach mindset. Like the Purists, this leads to a stricter lifestyle, intolerant of deviation, and the views of the Eastern Acserians lean toward the Fundamentalist. Fundamentalists, however, tend to eschew the Eastern Acserians, except when it is politically convenient not to. *- That was a mixed metaphor, wasn't it?